During our trip to Grassholm we visited two lighthouses. Both of which I never thought I get the chance to see let alone photograph – South Bishop and The Smalls Lighthouse. As we passed Ramsey Island on out way to ﻿Grassholm﻿ we had a view of South Bishop, but only a distant view. I hope to go back there another day. Smalls Lighthouse stands on the largest of a group of wave-washed basalt and dolerite rocks known as The Smalls. It is the most remote of the lighthouses around the UK and is approximately 20 miles (32 km) west of Marloes Peninsula in Pembrokeshire, Wales, and 8 miles (13 km) west of Grassholm. There has been a lighthouse here since 1776, the present one having been built in 1861 to replace the original wooden structure. I have often wondered what it would be like to be a lighthouse keeper, but to be isolated on a wooden structure built on a rock 20 miles from the mainland, exposed to the full force of the weather and seas hurtling in from the Atlanic must have required a very specific type of person. That that type of person is certainly not me! 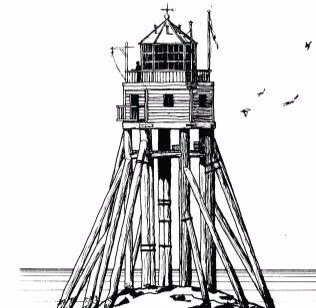 A drawing of the original wood lighthouse. Not a place for the faint hearted! Having left the Gannets at Grassholm we headed further out to sea towards what seemed like an empty horizon. The sea was dead calm, with very little swell despite the current caused by the tidal rush. then in the distance we were able to make out the misty outline of the Smalls Lighthouse. After serious storms during December 1777 repairs and alterations became necessary, but Phillips had no funds to carry them out. He discharged the keepers and extinguished the light and made over his interest to a Committee of Liverpool Traders. In 1778 Trinity House obtained an Act of Parliament authorised the repair, rebuilding and maintain the lighthouse and to collect and levy reasonable dues. In view of Phillips’ services and his financial losses, they granted him a lease on 3 June 1778 for 99 years at a rent of £5. Although this new lighthouse was described in 1801 as a “raft of timber rudely put together” it survived for 80 years. Whiteside’s novel design of raising a superstructure on piles so that the sea could pass through them with “but little obstruction” has been adopted since for hundreds of sea structures. An incident at the lighthouse caused a change in policy dictating that off-shore lighthouses should have a minimum of three keepers. In 1801 Thomas Howell and Thomas Griffith were assigned ther period of duty in the lighthouse. The two men were known to argue, so when Griffith died in a freak accident, Thomas Howell feared he would be accused of murder if he buried the body at sea. Despite sending off a distress signal the weather prevented andy assistance being sent. As his colleagues body be an to decompose Howell built a makeshift coffin for the body and tied it to the outside of the lighthouse where, blown by the wind the box started to fall apart. The arm of Griffith fell out of the coffin and as the wind caught it, eerily waved at the window of the keepers hut. Howell kept the lamp lit but it is said that when he was relieved from duty, the experience of living with the decaying corpse of his colleague, left him unrecognisable. From that time, until the automation of lighthouses in the 1980s all teams were made up of three men. The present lighthouse was built The present lighthouse was built in 1861 under the supervision of Trinity House’s consultant engineer James Walker to a design based on Smeaton’s Eddystone tower, taking five years to build. It is 41m tall, and at high water 36m above the water level. The light can be seen over a range of 18 nautical miles, or 21 miles (33Km). In 1978 a helideck was erected above the lantern and the lighthouse was automated in 1987. 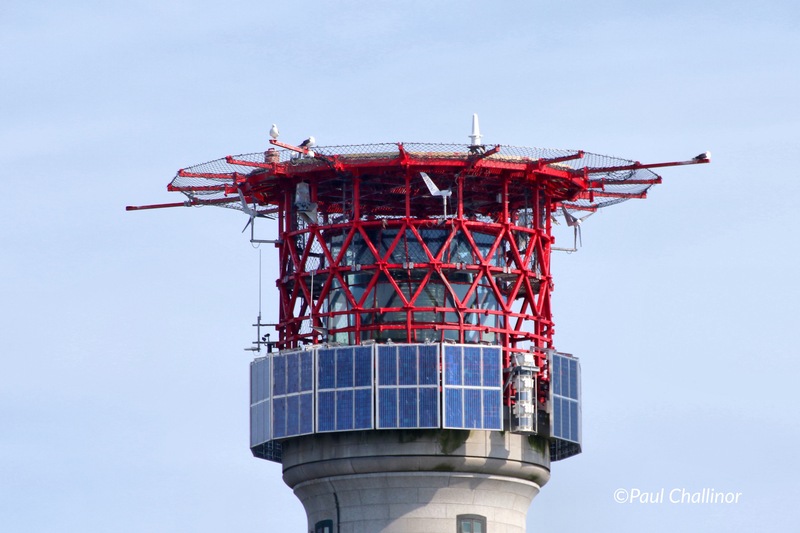 In June 1997 the red and white stripes that had distinguished the tower were no longer considered necessary for navigation and the tower was grit blasted back to natural granite. In today’s world the need for a manned lighthouse is no longer necessary, and modern technology means that it is possible to control the lighthouse from a distance. In fact on the other side of the UK, at Trinity House’s Planning Centre in Harwich, Essex. There was plenty of bird life out here. The top of the helipad seems to be a roost for cormorant and sea gulls, as were the rocks exposed by the low tide. After seeing so many Manx Shearwaters having been killed by Greater Black-backed Gulls on Skomer it was great to finally see one on the wing. At last a live Manx Shearwater on the wing flying past the lighthouse.